Tepeaca (Mexico) (AFP) - Standing in the middle of lettuce and onion fields that reek of gasoline, the farmers pause from their work to watch an army convoy drive by. Gripping their machine guns, the soldiers return the farmers' wary gaze. It's impossible to know which villagers are involved in the multi-million-dollar oil theft racket that has become a way of life in this remote pocket of central Mexico. "It's very difficult to detect who's involved in this activity," says one soldier, speaking on condition of anonymity for security reasons. The village, Tepeaca, is at the heart of Mexico's "Red Triangle," a lawless mountain region in the state of Puebla that sits on top of the underground pipeline that delivers oil, gasoline and diesel from the Gulf coast to the capital. The region is perfect for the business of stealing fuel. Its mountainous terrain isolates it from much of the country, while widespread poverty ensures there is a large work force ready to help. It takes a village to stage a successful pipeline theft -- a dangerous affair that can end in deadly explosions or shootouts with soldiers. Those who puncture the pipeline reportedly take home $10,000 for less than 20 minutes' work. Wielding the hoses used to extract the fuel can meanwhile earn you $8,000. Children earn up to $500 a month for acting as lookouts. The stolen gasoline is sold on the black market for $0.50 a liter -- well below the market price of about $0.87. These days, business is booming. State oil company Pemex says the number of pipeline thefts has soared from 186 in 2012 to 6,837 last year. And the pace has only accelerated since January, when the government increased the price of gasoline by 20 percent in an effort to deregulate the energy sector and revitalize an ailing Pemex. There were 2,683 thefts in the first three months of 2017 -- nearly 30 a day. Pemex says the problem has cost it $2.4 billion since 2010. Oil thieves are known here as "huachicoleros," and a popular sub-culture has emerged around them. They even have their own saint -- depicted with gas can and hose in hand -- and songs celebrating their outlaw exploits, like the "narcocorridos" dedicated to Mexico's drug traffickers. The economic impact of the stolen fuel trade is visible in Tepeaca, where flashy three-storey houses rise above unpaved streets. 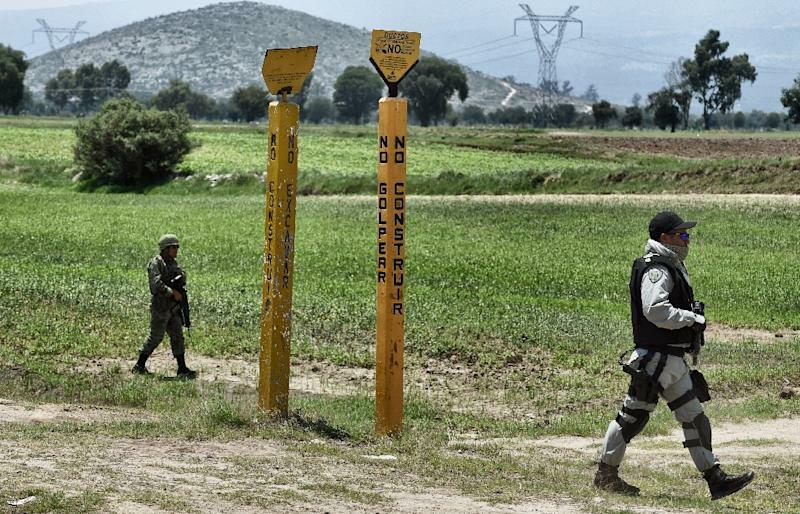 "We think one of them (the cartel bosses) lives in that house and the other one over there," a Pemex official on patrol with the soldiers told AFP. Pemex has an entire unit dedicated to stopping fuel theft. When the company detects a pipeline puncture, it shuts off the pumps. But Puebla's hills mean gravity keeps the fuel flowing long enough for thieves to steal dozens of truckloads at a time. A video taken recently by a Pemex drone shows trucks waiting at a pipeline puncture, lined up all the way to the edge of the frame in both directions. 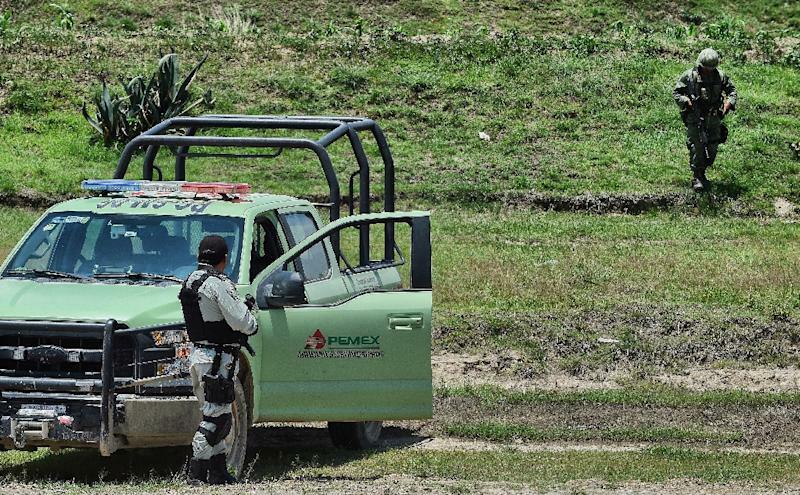 But even when Pemex detects such operations, soldiers are slow to arrive -- and when they do, the confrontations can be deadly. Last month, a shootout in the village of Palmar de Bravo left four soldiers and six civilians dead. The other risk is explosions. In the most recent incident, on May 13, four people burned to death in a fiery blast at a pipeline puncture. Still, there is no shortage of locals eager to join in. When one recent puncture went awry -- sending a jet of diesel into the air -- residents rushed to scoop up the fuel with buckets and sponges, even as the authorities watched. The stolen fuel gets sold on the street in plain sight, or even to gas stations. Last week, authorities shut down seven service stations for selling stolen fuel. Investigators worry corrupt Pemex employees, local officials and police are involved. Pemex executive Carlos Murrieta called for harsher sentences for fuel theft -- currently punishable by a maximum eight years in prison. "Fuel theft shouldn't be treated like any other theft," he told AFP. "It involves a broad part of society, it destroys the social fabric. It's a very serious crime."